Crossfire társasjáték - Magyarország társasjáték keresője! A társasjáték érték! A Crossfire egy kiváló társasjáték, 2 játékos részére, az átlagos játékidő rövid, csak 10 perc. A társast, 7 éves kortól ajánljuk kipróbálni. This game is played on a large board like a soccer field, approx 100x80cm. The players each have a rotating plastic gun attached to their end of the board, behind a wire goal frame. The idea is to fire ball bearings from the gun to knock your puck into your opponents goal, and keep theirs away from yours. The board is slightly curved to cause the balls to roll into pots at each end for re-use. A new version has been released by MB. The new version has more than one puck, and a smaller, rounded board. The original version came out in the 1970's and had a rectangular board and simple round pucks. Suggestion: Wear protection (e.g. a glove) on your firing hand - the moulded plastic gun trigger will give you a blister. Game variation: Place two differently coloured sets of toy soldiers on the board - shoot your opponents army while avoiding your own. Use loosely packed LEGO for fortress walls. This game is similar to Gunfight at OK Corral. The Purge: # 1630 Crossfire: I dare you to try and play this game and not sing the song from the commercial: Crossfire! 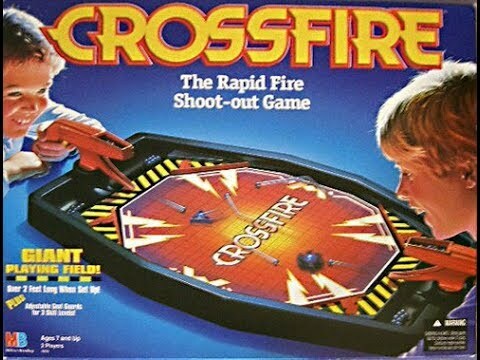 Crossfire!